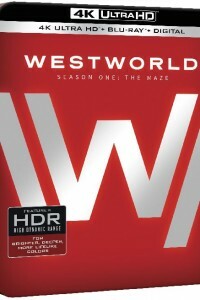 Westworld: Season One features a star-studded cast led by Academy Award® winner Sir Anthony Hopkins (Silence of the Lambs), Golden Globe winner Ed Harris (The Truman Show), Golden Globe and Emmy® nominee Evan Rachel Wood (The Wrestler) and Golden Globe nominee Thandie Newton (Crash). The cast of this 10-episode phenomenon also includes Jeffrey Wright, James Marsden, Ben Barnes, Ingrid Bolsø Berdal, Clifton Collins, Jr., Luke Hemsworth, Sidse Babett Knudsen, Simon Quarterman, Rodrigo Santoro, Angela Sarafyan, Jimmi Simpson, Tessa Thompson and Shannon Woodward. Executive produced by Abrams, Nolan, Joy, Jerry Weintraub and Bryan Burk, Westworld is produced by Kilter Films in association with Bad Robot Productions and Warner Bros. Television.